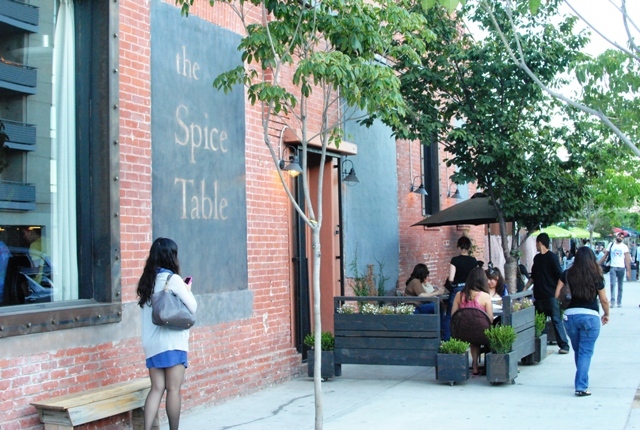 The Spice Table opened a few months ago, one of the latest additions to the ever-growing Little Tokyo/Downtown LA restaurant scene. Although chef Bryant Ng’s background includes being opening chef at Pizzeria Mozza (as well as working with Daniel Boulud and Roland Passot), the cuisine here is half a world away. 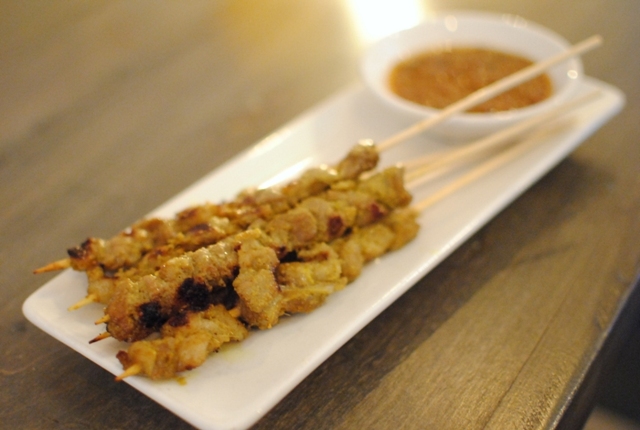 Inspired by the streets of Southeast Asia, the menu consists of small to medium-sized plates meant for sharing. The restaurant’s name is no misnomer – spice is king here. 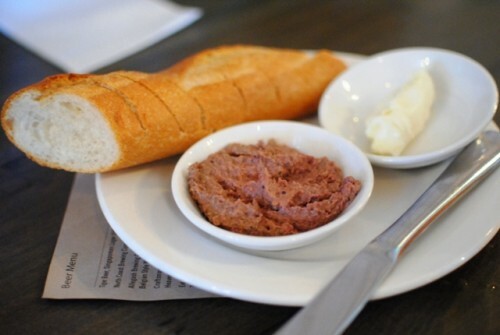 I enjoyed the pate – smooth, porky with a deep savory spice blend. The baguette was fine as a vehicle for the spread. Like butter. Rich and creamy, I thought the prawn flavor of the sambal brought a nice flavor profile creating a sort of surf & turf interplay. I tend to associate the belly with a fattier, more tender cut. However, this was a little chewy with some cartilage-like bits in it too. Hm. The flavors were there though; the building spice foreshadowed what was to come. One of the specials of the day. Really tender, squishy almost, with a nice sweet-spicy sauce. I enjoyed this quite a bit. 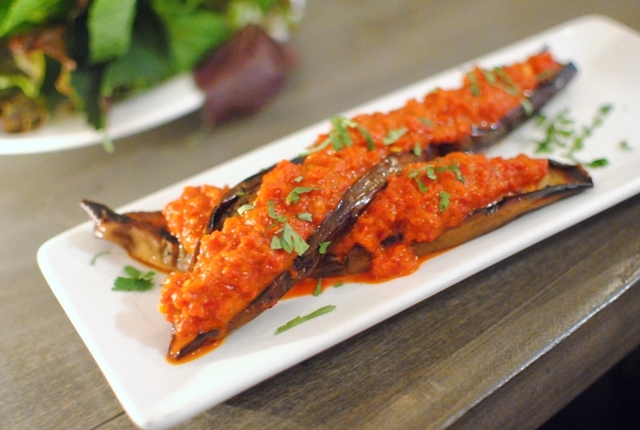 The eggplant’s texture was rather mushy and sort of creamy. On my first bite, I could taste the chile flavor, really the main flavor component. On the second bite, the heat had me rushing to my beer. 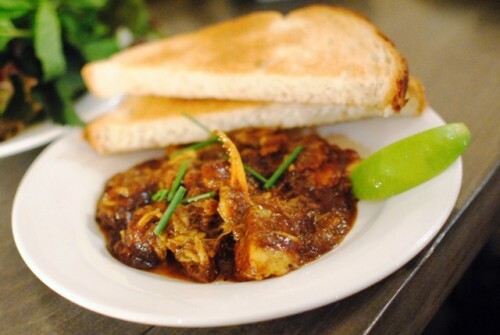 Loved the large chunks of flavorful crab on top of the crusty toast. A little bit of lime was a perfect complement. The heat of the pepper was slightly uncomfortable for me at times. You know, I’m not sure I’ve ever had pig tail like this. 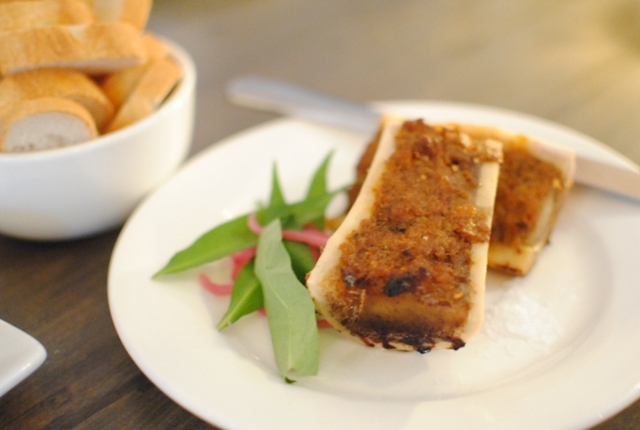 Kind of like a miniature version of oxtail. Tender and flavorful meat with a lot of gelatinous bits, the richness was countered by the cool basil and lettuce accompaniment. Luckily for me, this wasn’t as a spicy as I had feared. 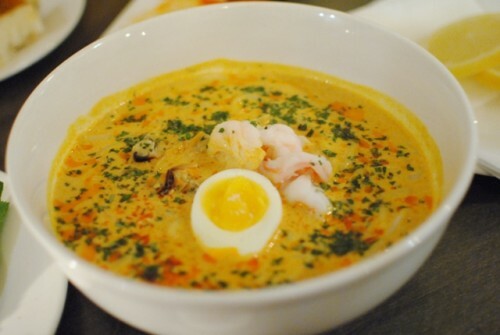 There was a creamy richness to the soup, featuring chunks of pork and shrimp. Homey and comfortable. I enjoyed the noodles, but wished they were longer…and perhaps with a little more chew. Another of the daily specials. 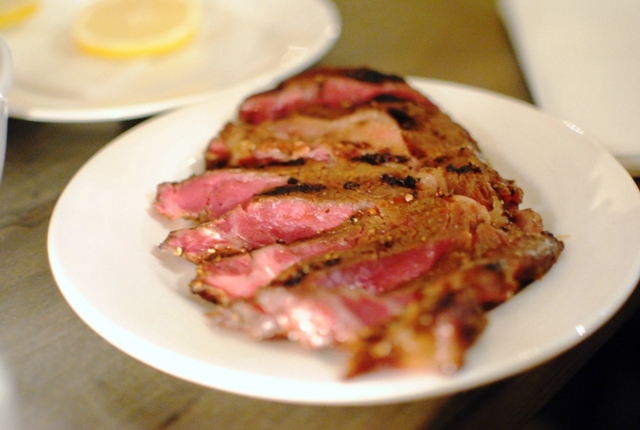 I could get the garlic, sugar and soy marinade flavors in the steak, which was tender and cooked well. Probably not one of the more unique items on offer, though. The restaurant features a ‘daily flavor’ of soft serve each day, though it’s been the same flavor on both of my visits. But seriously..milk tea?! Being a huge fan, this was a must-order. I thought this was a pretty good softserve, with a strong milk tea flavor really showing though. 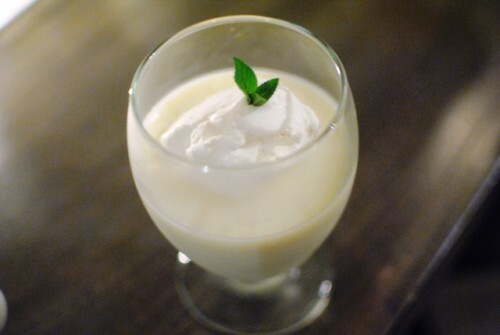 While the first dessert was very sweet, this was quite tart. The strong lime flavor was actually sort of refreshing (I could have used some during some of the spicy entrees), light and creamy. I didn’t dislike anything, but I didn’t love anything either. The Spice Table’s food was solid and full of flavor, but I’m not sure I fully appreciated it due to the fact that I can be kind of lame when it comes to spicy food. I will say that the meal was a little more expensive than I thought it was worth. North of $70 per person with just one beer each, it wasn’t cheap. Still, I don’t come across this type of cuisine too often (especially in a more upscale atmosphere), so I’m glad I was able to try it. Hah. Yes I would admit I probably have less tolerance than the ‘typical’ Asian. Is that going to be a new nickname? Mr. Spice Wuss? LOL jk. I agree with your take (since I ate the same thing as you that night). The meal was quite solid, but I’m not sure if it’s worth $70/pp. If the price wasn’t a concern, there were def more hits than misses during the meal, but that rib eye was quite disappointing. Thankfully that laksa was quite delicious! Man I hope that doesn’t stick! Glad you agree – food was solid enough, but the price point was on the higher side. It’s okay Darin, I’m a spice wuss too lol don’t let them mock you! Haha I’m dying to try those pig’s tails though! 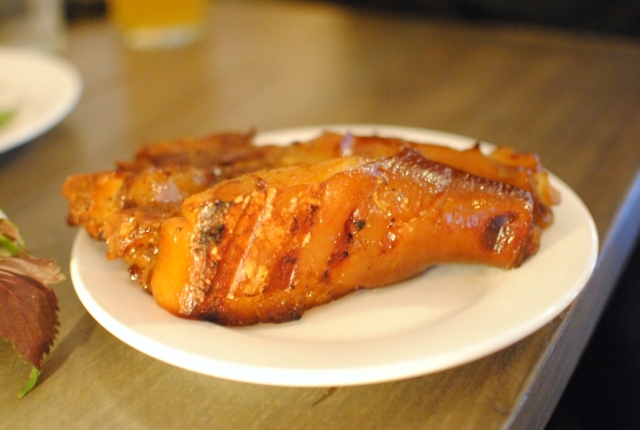 Yes, though…Night + Market has some bomb pig tails. I loved the pepper crab toast and the pig tail! Next time I’ll have to have the soft serve. I’m a wuss when it comes to spices too. Same here Eleana – prob two of my favorites from this visit. 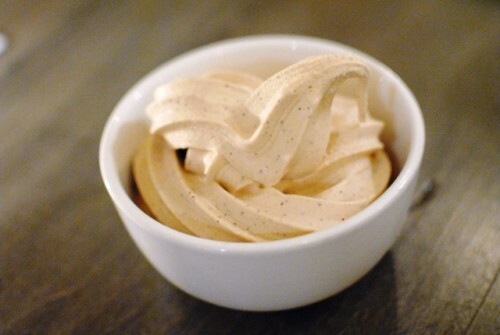 I think the soft serve would be good throughout the meal…helps to cool the mouth down! See, I love me some spice, and The Spice Table has been calling my name for awhile. Interestingly, the things that look the best to me are the beef tripe satay and the pig tails. Given your review, though, maybe I’ll slot this a little further back in the list for now. If you’re a fan of the spice, I don’t want to detract you from visiting…it’s probably a very different appreciation for the meal. 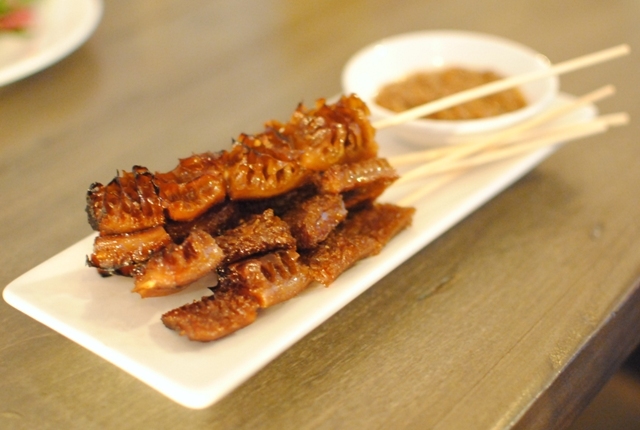 Tripe satay and pig tails were some of my favs, though less on the spice. I still haven’t been because I’m not sure the value for the price point, but I’m sure Angela and Mark will convince me to join them one of these days. Enjoyed the review Darin. The value is definitely a contentious issue! Worth a try though if Angela and Mark and successful in convincing you to drop by! perhaps they should rename it the Price Table. Our dinner there wouldn’t have been that bad if the prices were slightly more on the realistic side for the portions you get. Seriously, for what they charge, they really should serve ‘family’ style portions, not just in name only. Sounds like you didn’t have too good of an experience. I would agree on the portions, my meal was more expensive than I would’ve liked.